By Scott Gilfoid: Now that Andre Dirrell (20-1, 14 KO’s) has passed his first test in making a comeback last night in his outstanding 2nd round TKO win over Darryl Cunningham, Dirrell needs a middle of the road contender before he steps it up a couple of notches to challenge for the world title against one of the champions. I think the ideal mid-level fighter would be James DeGale or Groves Groves. Those guys are good fighters but are missing significant arts of their games needed for them to capture a world title. Dirrell, of course, could pick out some really quality fighters next but it’s not smart for him to get right back in the fire after only one fight. That’s what I see a nice safe fight against Groves or DeGale as the perfect tune-up for Dirrell. DeGale – has little power, no foot movement, can’t cut off the ring to save his life and lacks hand speed. He would be in serious trouble against the faster and harder punching Dirrell. DeGale is basically glorified slapper who hasn’t adapted from the amateur ranks to the professional level as of yet. Not sure that he ever will unfortunately. Groves – In some ways he’d be a better fight for Dirrell than DeGale. However, Groves doesn’t move his head much, is weak in close, lacks huge power and is too dependent on his constant movement to keep from getting hit. Groves isn’t someone that can you make you miss or block shots when trading. He’s someone that has to run or else he gets beaten up against a fighter like Dirrell. Groves would be fine against Dirrell until he gets hit with a lead left. At that point, Groves may hit the canvas. If he stays on his feet, Dirrell will flurry on him until he hits the deck for the 10 count. Dirrell just needs some rounds against one of these two ambitious fighters. Neither of them have the skills to last long against Dirrell when he’s firing missiles and thinking knockout. 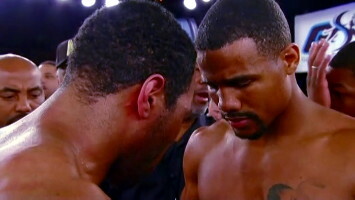 Dirrell needs one or two good fights in 2012 and then go after the world title. Ideally, it would be good for Dirrell to fight DeGale first and then Groves to get ready for a title shot. It would be like facing two good sparing partners to get ready for the big fight against Andre Ward or Lucian Bute.